The following are movies or feature-length home videos featuring Al in one way or another! Al was red hot in 1984 coming off the success of "Eat It" and the In 3-D album. That's when Twenieth Century Fox asked him to write and record the main-title song for their upcoming gangster spoof, Johnny Dangerously. Directed by Amy Heckerling (Fast Times at Ridgemont High), the movie follows the sudden rise of a Chicago crimelord (played by Michael Keaton) who is at odds with his district-attorney brother (Griffin Dunne). The theme song that Al came up with, the cool original "This Is The Life," perhaps better captured the spirit of the 1930s than the movie actually did. The song was not only used in the movie, but it also became a single and a music video. However, when the movie was released on home video, the song was nowhere to be found due to some still-unclear legal-clearance snafu (yet it was in the movie during most television broadcasts). It wasn't until the 2002 DVD release that the song was restored to the opening credits. Almost as a sort of retro-vindication, the DVD also includes the movie's original trailer, which proudly proclaims, "Theme song by 'Weird Al' Yankovic." Unfortunately, in a situation not unlike that of 1996's Spy Hard, once Al's song ends, the movie sputters. It starts off with a great sight gag, but then quickly slows down to a comic pace and style somewhere between Police Academy and Mel Brooks's lesser comedies. Although this spoof is hardly as bad as Scary Movie 2, everyone involved has since done better work. 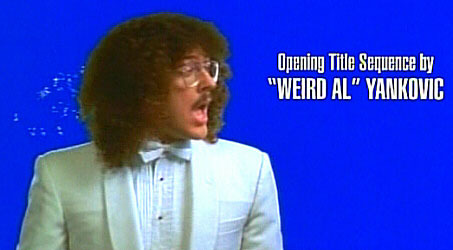 The very first Weird Al home video release, doubling as a semi-fictitious biopic and as a compilation of the music videos made up to that point. It can seem a little bogged down at times, but overall it's very funny and amazingly well done for a direct-to-video production (consider this is 1985, when a direct-to-video movie was almost unheard of!). The Compleat Al is also known for featuring a handful of clips from the first two Al-TV specials, an exclusive mini-video for "Midnight Star" (depicting Al's tour crew fixing up his hotel room), and a lot of Nick Yankovic's home movie footage of young Al growing up (mostly spinning around and falling). A squashed version of The Compleat Al aired on Showtime in August 1985. Although there has been some occasional "official" word of otherwise, the video itself has been out of print for a little over a decade. It's actually pretty hard to find, even in video rental stores. Maybe one day in the future it will be released on DVD...yeah, like that'll happen! How do you make a bizarre animated movie even more bizarre? Give it a hip, new age soundtrack! Scotti Bros. released the soundtrack album over the summer of 1986, and the resourceful record label included their headlining comedic musician Weird Al. 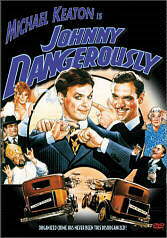 Instead of Al creating a new song for the movie as he did in 1984 for Johnny Dangerously, Scotti Bros. simply took the title track from Al's previous album, Dare To Be Stupid. The song was used effectively in the movie as the "theme" for the planet of the Junkbots. And let's not even go into the fact that one of the new songs in the movie, "The Touch" by Stan Bush, is the same song Dirk Diggler records in Boogie Nights! The Transformers: The Movie didn't do great at the box office, but it became an immediate cult hit. For the longest time the video was out of print in the United States, while at the same time various "director's cuts" turned up in Canada and Japan (they featured an extra line of dialogue...with a curse word! Oooooo!). Finally the king company of cult, Rhino, reissued the film on video and DVD in 2000, introducing it to a whole new generation of Transformer fans (boy, that sounded like the last line in any random Behind the Music episode!). 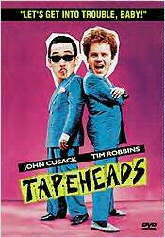 Produced by ex-Monkee and video pioneer Michael Nesmith and starring not-yet-critically-acclaimed director Tim Robbins and John "I will always be an aging Gen X star" Cusack, Tapeheads is about two fired security guards who try their gosh-darnedest to break into the booming video-production biz. Despite featuring quite an eclectic mix of celebrity cameos (including the likes of Ted Nugent, Doug E. Fresh, and Don Cornelius), Tapeheads is probably only noteworthy because it contains Al's first movie appearance. And it's not even a great appearance! Al is seen shoving Cusack aside while on his way out of a building, or at least that's what it looks like. The action is so far away from the camera that it looks like the director was far-sighted (let's put it this way: if Al wasn't credited you would have thought it was a look-alike). The original video release from Nesmith's Pacific Arts went out of print a few years ago due to Mike's financial and legal troubles with PBS, and the movie pops up on TV only once in a blue moon. So when indie and cult-movie savior Anchor Bay reissued the film on video and DVD in March 2001 (with DVD commentary by "Papa Nez," director Bill Fishman, and production designer Catherine Hardwicke), this once-rare Al oddity became readily available again. Now this is the Al film cameo that everyone remembers! The story goes is that when Al heard that his favorite television series, the short-lived comedy Police Squad!, was going to be transformed by creators David Zucker, Jerry Zucker, and Jim Abrahams into a feature-length film in the same vein of the ZAZ team's previous Airplane! and Top Secret! (Al's favorite movie, no less! ), he begged and pleaded with the producer to get him a cameo any way possible. Not that it was such a chore, since the producer was Robert K. Weiss. Weiss had previously helped write The Compleat Al--including the videos for "Like A Surgeon," "One More Minute," and "Dare To Be Stupid"--and co-directed it with Jay Levey. 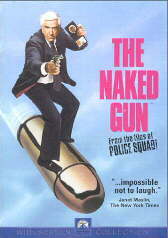 Weiss talked briefly about Al during the DVD commentary for the movie, saying that they invited Al back to make appearances in the other two Naked Gun films because he always remembered his lines. For those of you who have not yet seen this comedy classic (and you must! ), or did not go to a concert during which the clip was shown on the video screen, Al appears near the beginning of the film after Lt. Frank Drebin (the hilarious Leslie Nielsen) mistakes Al's airport-greeting party for his own. The Naked Gun is a standard on cable TV, but since September 2001 the entire opening sequence (in which Frank beats up the likes of Khadafi, Yasser Arafat, and Gorbachev during a secret meeting for devising terrorist acts) is sometimes removed from broadcasts. Fortunately the movie is available on home video, because despite the recent extra-sensitive nature of terrorism it is still a gasping-for-air-hilarious scene. For those of you who do not know, Al wrote and starred in this little-known movie called UHF about a television station and the unusually popular programming decisions made by its new manager. To read all about it, you may want to check out our UHF Anniversary section. MGM listened to our pleas (prompted by some web page out there) and finally released UHF as a "special edition" DVD in June 2002. The movie became a Top-10 hit in Variety and received glowing reviews after thirteen years of being called a "bomb." This is an essential piece for any Al collection, so order the Region 1 DVD or the European Region 2 DVD now! And although the video is long out of print, used VHS copies can still be tracked down on Amazon's Marketplace. Perhaps the most frequently asked question about Al's film work is "Where the heck is he in The Naked Gun 2 1/2?" Believe it or not, Al's cameo appearance usually kicked off the TV commercials for the movie. He's the scraggly punk who's holding the Police Squad! officers hostage at gunpoint...that is, until Frank knocks him out with the door while entering the room. Al is perhaps the only man who ever pointed a gun into O.J. Simpson's face and lived to tell about it! The reason a lot of people can't seem to recognize Al is because it was one of his rare pre-1999 appearances in which he was clean-shaven and without glasses. Maybe a fan who had just started digging Al in only the last couple of years will be able to pick him out more easily? And Al's official credit in the cast? "You pigs...say your prayers." --part of the Naked Gun trilogy tradition in which actors without character names are credited with their lines of dialogue. And Al is back with the rest of the Naked Gun cast in this third outing, definitely solidifying his role in the series as a sort of running gag. This time, however, Al is actually integral to the plot, since Frank and his wife Jane have to stop a madman (Fred Ward!) from blowing up the Academy Awards ceremony in L.A. Frank can't get in on his own since he doesn't have an invitation (nor his police badge, because he was working undercover of course). And who happens to come along? Vanna White and her date for the evening...Al! Frank and Jane not only kidnap them and steal their invitations, but they also take their clothes! Al and Vanna later show up in their underwear (Al's boxers are of course Hawaiian-styled) and finger Frank as the thief. The movie is worth seeing just for the musical number with Pia Zadora. As you might have just read, Al was asked to write and record a theme song for the 1984 gangster spoof Johnny Dangerously. Well, he did, and it was called "This Is The Life." The song was played over a rather generic-looking opening title sequence. However, when the film was set for a home-video release, some legal problem prevented Al's song from being included. Twelve years later, Al is called upon once again to write an opening theme for a movie parody. Fortunately this time, Al also shot the credit sequence himself, probably to help insure that his song will be heard on the video. Yet unfortunately for the film, Al's opening was the funniest scene in Spy Hard. 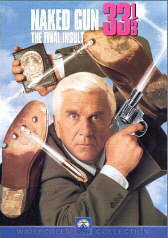 The rest of the movie combined stale, repeated gags that were much funnier in the Naked Gun trilogy; gratuitous celebrity cameos by the likes of Pat Morita and Dr. Joyce Brothers; and ten straight minutes of golf jokes (yes, the writers of the film also did those nine hundred Leslie Nielsen Bad Golf videos). But for Al completests out there, the movie also holds a special surprise at the end, an alternate version of the "Spy Hard" song. Since it's heard during the end credits, the last verse is put into the past tense. "You just saw Spy Hard!" No, no, we're not going to give you some vague connection to this video like "Al was once inspired by a frame of 'Blood on the Dance Floor'" (LOL!) or "Al parodied every other beat in the song 'Scream' for 'Germs.'" Al actually appears in this video collection of the Gloved One's best videos...err, that apparently weren't good enough to appear on Volume I. In Jacko's video for the song "Liberian Girl" (no, we've never heard of it, either), Mikey assembled a slew of celebrities and friends to make cameo appearances throughout. At one point, eternal dork Ricky Schroder asks, "Is that Michael?" The person he is referring to turns around, and it's Al! Later in the video, Al is seen playing his accordion to the song. All of Al's music videos in order through 1996! It even includes the Spy Hard opening title sequence in letterbox (the actual credits were removed for legal reasons, though). 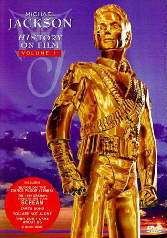 Originally released only on laserdisc, the DVD edition came a year later with enhanced audio on the first six songs. If you were an Al fan and you had a DVD player, then this was a must to own (another collection has since taken that honor). With the exception of one minor late chapter start (if you jump to "You Don't Love Me Anymore," it will go right into the song...the video's opening was accidentally tacked onto "Smells Like Nirvana's" chapter), the overall disc looks great. There are no extras outside of the cool liner notes on the packaging, but still it's a nice-albeit-modest release from Image Entertainment. Of course, this out-of-print DVD was overshadowed in 2003 by The Ultimate Video Collection, but it is still highly sought-after on the secondary market. And for you trivia buffs out there, The Videos was also the last Al product released on the Scotti Bros. label. Soon after, Scotti's parent company All American Music was purchased by Zomba's Volcano Entertainment...and the Al legend lived on! Feeling lucky? Then try to track down a copy of the DVD on Amazon's Marketplace. Be prepared to pay a lot. 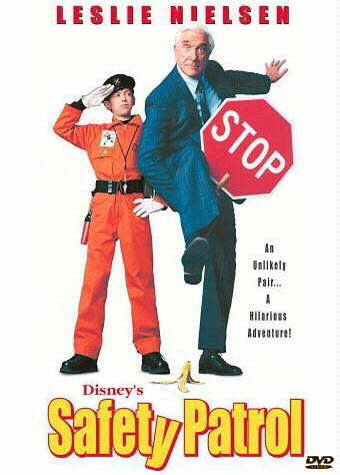 Safety Patrol is one of those movies that you really want to like, but then you remember that Booger from Revenge of the Nerds is in it. Depending on who you listen to, this movie had quite a unique history. Reportedly, originally it was going to be a Leslie Nielsen vehicle a la Spy Hard and was to be on television by mid-1997, but when Leslie backed down to nothing more than two fleeting "guest appearances" the entire plot was reworked to focus on young Scout Bozell (played by Bug Hall). No matter if all that is true or not, the movie was in production for seemingly forever. Director Savage Steve Holland asked his old buddy Al to record a new song for the movie, "The Ballad Of Kent Marlow," in March 1997. The film didn't premiere on ABC until one whole year later. Unless there was some extensive Industrial Light & Magic work done to it that doesn't appear in the final cut, one must wonder what happened during that year? Al and the band lipsynched to both the new song and "Gump" toward the end of the movie at a concert. Equally cool is that a gigantic Weird Al Macy's Thanksgiving Day Parade-style balloon was created for the film. After their scenes were shot, the band took the balloon along with them for the summer, 1997 leg of The Bad Hair Tour. And click here to tell Disney you want it released on DVD! Judy Tenuta stars in this smart Hollywood satire about the life of former child stars, an inspired concept that was completely tarnished in 2003 by Dickie Roberts: Former Child Star (a movie that contains a number of "coincidental" similarities to this one). Judy plays Joanie Sweeney, star of the 1960s sitcom Daddy's Little Angel, who is hoping to make her big comeback by any means necessary. Rather than getting her acting gigs, her agent instead tries coming up with bigger and more-humiliating publicity stunts for her to partake in. This movie has two special Al connections. Most importantly is that Al makes two funny cameo appearances in the film, as do other celebrities such as Emo Philips, Burt Ward, Dana Plato, and particularly Erin Moran. Filmed in 1997, this may be the very last appearance of Al in his "classic" mustache-and-glasses guise (that is, and have the mustache be real). The other connection is that a workprint version of the movie was screened at ALCON 2000. Although the ending of this early cut was edited around for the released version to make the outcome seem more positive and less comtemplative, the end result still works while also commenting on a point made earlier in the film. Although it's still recommended, the DVD presentation could have been a little better. Was the movie actually shot in full-frame format (that would make sense to a point, considering the film's subject), or are we being deprived of a letterbox picture? The extras only include a trailer and filmographies stolen from the IMDb. It's obvious from the end-credit sequence that outtakes exist, so where are those on the DVD? Surely a film that was in limbo for several years would warrant a commentary, right? Oh well, I guess we've been spoiled by the UHF DVD. Al's first home-video release through Volcano Entertainment proved to be a hit, and why wouldn't it be? Al fans had been yearning for years for a live concert album. So, Al did one better and released an entire video of a performance! He even included the music videos of "The Saga Begins" and "It's All About The Pentiums" as a bonus. What a guy! The DVD went even further by including two educational films that Al showed during Touring With Scissors, "Germs and You" and "Crimes of Carelessness." Plus there's a photo gallery, enhanced audio, and Al's commentary on the two videos. A MUCH better DVD than The Videos. It's hard not to recommend it! Sigh......here we go. Trying to make this sound interesting. In 1998 Warner Bros. bought the U.S. rights to the Japanese Pokémon cartoon series, based on the disgustingly popular Nintendo video-game characters. Anyway, since the TV show was such a successful electronic babysitter, Warner Bros. thought they should also import the incomprehensible Pokémon animated movies from the same country. To make the first movie, ironically and threateningly titled Pokémon: The First Movie, seem more American, Warner subsidiary Atlantic Records released a soundtrack featuring squeaky-clean teen acts like M2M singing "hip" songs that were usually relegated to one-minute excerpts over the film's end credits. 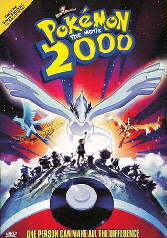 Well, since that was a big success, Warner Bros. thought they would do the exact same thing to the sequel, in this country titled Pokémon the Movie 2000: The Power of One (fortunately, we missed out on parts 2 through 1999). In addition to Donna Summer, the B-52s, and that dorky group from the show Popstars, our pal Weird Al was brought in to record a new polka all about those unstoppably annoying Pokémon critters. If you listen really hard, you can hear a snippet of Al's song, "Polkamon," over the end credits. 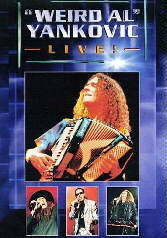 In early 2003, plans were made to rerelease the previous Al music-video DVD, "Weird Al" Yankovic: The Videos. For whatever reason, those plans were scrapped in favor this all-new, souped-up collection containing all of Al's music videos...and then some! This new DVD includes all the music videos through "It's All About The Pentiums," the "Bob" video shot for 2003's Al-TV special, the Spy Hard title sequence (this time actually featuring two key on-screen titles! ), Al and Jon's 1981 performance of "Another One Rides The Bus" from the old NBC Tomorrow Show, The Weird Al Show opening-theme sequence and the three music-video clips from the series, a cool photo gallery, and a very special easter egg that fits in with the disc's theme. The videos themselves have been remastered and they both look and sound great (although some of the older videos may have an odd "tinny" sound to them depending on your DVD player's audio set-up). There's even on-screen lyrics and updated liner notes. As the title indicates, by definition this should be the end-all, be-all, final Weird Al music-video collection that will stand the test of time, and there's no reason why it isn't! This page was last updated January 15, 2007. 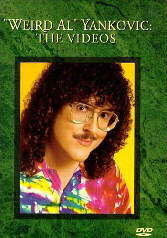 "Weird Al" Yankovic: The Videos ©1997 Scotti Bros. Desperation Blvd. ©1999 Desperation Blvd. Inc.
Pokémon the Movie 2000 ©1999, 2000 Nintendo/Warner Bros.